Are you looking for some Harry Potter Christmas gifts for girls? My guess is that you want something a little different than what usually comes up in a search for gifts for the Harry Potter fan. So, I have not listed the magic wand that you see everywhere. I have compiled a short list of unique and different gift ideas for girls who just can not get enough of Harry Potter, Hermione Granger and the rest of the Hogwarts students, faculty and characters in the books and movies. So many of the items seem to be fashioned for boys but there are definitely items that will appeal to the girls also. My guess would be that she already has each of the books and probably has the movies, too. There are still some great ideas with the Harry Potter theme that she just may not have. Personally I think I would have LOVED this bracelet as a teen. I’m slightly tempted now, even though I generally don’t wear jewelry. It is a very fashionable statement for the true Harry Potter fan – teen to young adult. She will love the Deathly Hallows symbolism as well as the way the snitch and Harry’s owl Hedwig are worked into this bracelet. This is really both a Lego SET and a board game. So your girls (and boys) can go either way with it. Obviously Hermione is included as one of the main characters in the books, but if your girl has her own favorite character, she can of course pick some other lego-mini-figure to impersonate her (Minerva McGonagall comes to mind). This is the sort of gift that a Harry Potter fan will enjoy – and also learn from. Challenging and teaching spacial awareness, aka math. Enjoyed by both boys and girls of 10 through 13. Which Is Your Favorite Movie In The Harry Potter Series? 35 people have voted in this poll. Puzzles are an old favorite. They are fun and help children (and adults) develop logic, spatial reasoning and keep a connection to the physical world. That may sound dramatic, but really, with so much time spent on devices, anything that works by simply touching it is comforting in its reality. The sorting hat makes it’s first appearance in the first book: Harry Potter and the Philosophers Stone (or Harry Potter and the the Sorceror’s Stone). Every Harry Potter fan wants a wand, of course? How else can we do magic? For a girl, the obvious wand to want is that of the ‘smartest witch of her age’ Hermione. Top of her class, essential in the fight against ‘He Who Must Not Be Named’ and future ministry of magic reformer, no doubt. A great gift idea for a teen girl who is a Harry Potter fan. A junior size t-shirt in red with the Gryffindor emblem on the front and sporting stripes on the sleeves. It is cut to be complimentary to teen girls and women with a slender build. She can wear it with her favorite jeans. She will love having Hedwig which is Harry’s favorite owl. This can be a favored stuffed animal but also can be attached to her clothes, arm or something else to perch wherever she wants it too. She can even use it as a part of a Harry Potter costume. In Harry Potter and the Prizoner of Azkaban Hermione Granger takes so many subjects at Hogwarts that she needs extra time. Luckily for her, wizards can actually make sure you get more time… In the end this time turner plays an important part in saving a wizard and a magical creature. Chances are, she is a fan of Hermione Granger. Most girls are. She would absolutely love this replica of Hermione’s Time Turner. It is plated in 24 karat gold and measures about 1 1/2 inches in diameter. The chain is 18 inches long. The hourglass works and the rings inner rings rotate. Possibly my favorite Harry Potter movie character. I mean, I liked Luna Lovegood in the books, but she’s just darling in the movies. Naive, but smart and in some places: crucial. And these Luna Lovegood Spectra Specs are make a fun stocking stuffer (I almost wrote stuffing stocker). Another idea for the teen fan of Harry Potter. A girl’s varsity hoodie with the Hogwarts emblem on the front and the back. The body of the jacket is red with black trim and the sleeves are black with red trim. An officially licensed product it is sized in Junior sizes. Fabric is 40% polyester and 60% cotton. Machine washable. A nice gift for any girl who loves Harry Potter. This decorative throw can be placed on her bed or hung on a wall. She can wrap up in it while she is reading a book or watching a movie on a cool evening. The Hogwarts emblem is designed in a very colorful effect. The throw measures 48 inches by 60 inches. Whether she is a young Harry Potter fan or a grown-up fan, this is a lovely and different gift for her. A fun gift boxed set of two of the textbooks that students used at the Hogwarts School of Witchcraft and Wizardry. Both books were actually written by J. K. Rowlings under fun pseudonyms. Both are an exceptionally fun read for any Harry Potter fan. Each book explains better the delights and dangers of the world of wizards. They can learn about the beasts and their habitats and habits and also learn about the history of Quidditch. There are also funny little notes that are supposed to be from Harry, Hermione and Ron to give them a real chuckle. I think it is definitely something that should be in every Harry Potter collection! Hedwig was a gift to Harry Potter and the most resourceful of Snowy Owls, delivering messages throughout the film series and a constant companion to Harry. 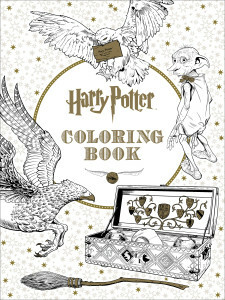 A deluxe keepsake of Hedwig with a removable-lid cage comes in this package alongside a 16-page book of vivid stickers that allows fans to relive the magic of a boy and his owl. Hogwarts Marauder’s Map – morphing cup! The Marauder’s map is the way Harry gets around Hogwarts when trying to avoid enemies like Snape. It plays a huge part in both the movies and the books – the final emotional twist is that it was actually created by Harry’s dad and his friends. The map can be disguised as a simple bit of parchment, when tapped with a wand and saying ‘mischief managed’. Unfortunately, our muggle manufacturers can recreate that magic. They come close though with this morphing cup: the map only shows when there is a hot drink in the cup. A fun stocking stuffer for the Harry Potter fan! This beautifully crafted Harry Potter Action Figure will entertain you with spells and dialogues from the movies with the simple push of a button. He comes dressed in his Hogwarts school uniform, carrying his signature wand. If Harry is here his best pal Ron can’t be far away. Complete with the Magic School Uniform, Ron’s own wand, and a display stand – this Action Figure will complete the Harry Potter Action Figure really well. This Hermione Granger Action Figure with Sound completes the Triumvirate of Wizard friends. It really isn’t hard to know someone who is a Harry Potter fan because the series of books written by the British novelist, J. K. Rowling is the best selling series of books in history. To go along with that is the series of movies that were made from the books that became the highest grossing film series in history. Now, think about it, that is truly an accomplishment! Adults and kids alike have had a delightful time in the fantasy world of wizards and witches that was shared by a most remarkable woman. The author has had an almost magical life with something that might have come from a fairy tale. A sort of rags to riches kind of tale except that it is not a piece of fiction. In the span of five years, Rowlings went from receiving government assistance to being a multi-millionaire. And it all stemmed from an idea she had while waiting for a delayed train in 1990. I don’t know about you but I am glad that she shared her fantasy world with the real world, took that gamble and saw it all through.